In 2013 we listed the ‘top 10 most popular dog breeds’ in the UK based on Kennel Club registrations and gave a bit of insight into why we thought they were popular. At the time the Labrador Retriever was in poll position (17,733 registrations) – a position it’s held for several years, and the Staffordshire Bull Terrier came in tenth (2,720 registrations). Over the years, the list of popular dog breeds has fluctuated, with new breeds emerging and others fading to obscurity. However there are some breeds that have maintained their popularity for decades, including the Cocker spaniel and the Bulldog. To keep on top of changing trends, we have updated our list of popular breeds with KC registrations taken from 2014. Bar a few variations, the top 10 looks fairly concrete, although a greater number of registrations were made. Whatever it is about these particular breeds that appeals to people – whether it’s their appearance, temperament or certain breed traits, many UK dog owners are clearly of the same opinion. Once again, the Labrador takes victory as the UK’s most popular dog breed, with a record number of registrations being made last year. Described as ‘the best all-round dog’ by the Kennel Club, its enduring popularity as a companion and service animal isn’t surprising when you consider its gentle demeanour and intelligence. Originally utilised off the coast of Labrador and neighbouring Newfoundland in Canada, helping fishermen to retrieve fish and retract their nets, the Lab is a traditional working animal with keen skills and a natural affinity with water. 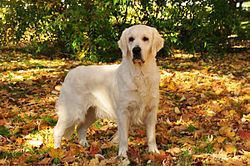 The Labrador of today was developed in 19th century England and was officially recognised by the Kennel Club in 1903. 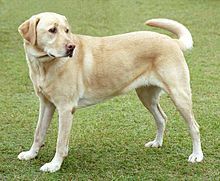 Typically a proportioned and sprightly-looking breed, the Labrador retriever boasts strong legs, a broad head, medium-sized pendant ears, and wide-set eyes. Today, the Labrador is observed in hunting, tracking, retrieving, military and police work, search and rescue, competitive obedience, agility and as a guide dog to the blind. The Labrador is a great lover of people, perhaps why people are a great lover of it! Click here for more information on the breed. Taking second position is this versatile hunting gun-dog. The Cocker Spaniel was prominent during the Tudor reign of Henry VIII and proved a favourite in the royal courts of the 16th and 17th centuries. It isn’t hard to see why the Cocker spaniel remains so fashionable when you consider its pretty, distinctive look and easy nature. 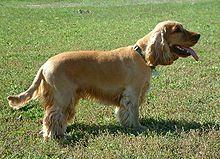 Characterised by an arched head, low-set ears, ovular eyes and a soft, wavy coat in colour deviations of solid black, red or liver, the Cocker spaniel is widely recognised and is considered the original family companion, proceeding the Labrador and Golden retriever as the dog most compatible with children, other pets and domestic living. The breed experienced a resurgence in popularity following the acquisition of a black Cocker spaniel, named Lupo, by the Duke and Duchess of Cambridge before Christmas of last 2012. Click here for more information on the breed. 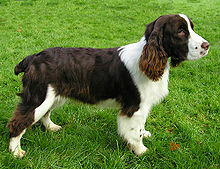 Larger than its cousin the Cocker spaniel, the English Springer is a strong competitor in the popularity contest. Deriving its name from its early usage as a game flusher, 'springing' furred and feathered game from the bush in order for the hunter to shoot it, the breed is revered for its ability to work tirelessly in a variety of working pursuits. Having retained its popularity as a companion dog since its early prevalence in the Renaissance, the English Springer spaniel is often described as the ideal family dog. With a coat that is typically wavy and feathered and common in colours of white and liver, usually with black, liver or tan markings, the breed is both attractive and relatively low-maintenance. It possesses an amiable and relaxed temperament, displaying affection and loyalty towards its family and engaging well with children. Owners have described the Springer apaniel as being ‘full of life and character,’ and making a great addition to active family life. Click here for more information on the breed. Up 4 places from 2013 and 8 from the previous year, the ‘Frenchie’ is now a popular breed choice across the country. Contrary to popular belief, the French Bulldog hails from Nottingham, England, where it was the breed choice of lace makers and craftsmen in the city. Popular amongst the artistic and eccentric of Parisian city dwellers also, the French Bulldog grew in favour there, retaining its name on its return to England, as well as its concrete reputation. 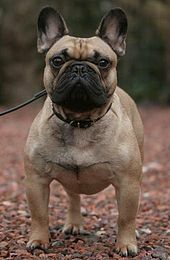 A compact dog of stocky build, the French Bulldog possesses a steady temperament, despite its bullish appearance. A popular lap dog and ladies’ companion, the Frenchie is well suited to the home setting, being compatible with both children and other house pets. Time has proven the popularity of this breed, which is unlikely to ever go out of favour. Click here for more information on the breed. This entry might come as a bit of a surprise. Much conjecture surrounds the origins of the Pug, although it was probably made popular during the Victorian period when it was commonly observed atop private carriages. As a breed, it has boasted many notable admirers, including Napoleon's wife – Josephine, Queen Victoria, and the Duke and Duchess of Windsor. The breed has several distinctive features, including a broad, flat and pronounced muzzle, prominent eyes, low-set, triangular ears and a short tail, arching over the back. The Pug is a suitable breed choice for families or a dedicated sole owner wanting a lap dog, due to its calm temperament and its compact proportions. Animated and full of spirit, a Pug is guaranteed to liven up any home setting – perhaps accounting for its popularity! Click here for more information on the breed. Despite falling down the rankings by 2 places, the German Shepherd – otherwise known as the Alsatian – is arguably the most popular breed worldwide. Founded in 1899, the Shepherd was primarily bred as a versatile working dog, developed to be fearless and agile for the purposes of military and police work. 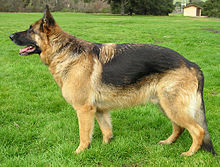 The German Shepherd retained its concrete reputation across Europe and the United States following its wide usage during World War I.
Athletically built to change direction at full speed, the appearance of the German Shepherd reflects its versatile working capabilities. 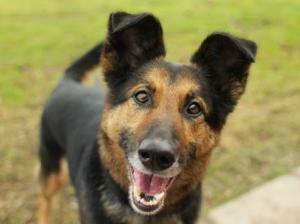 Contrary to popular belief, a socialised and consistently trained German Shepherd will not display undue aggression. Instead, a Shepherd will demonstrate a calm and gentle manner - having an enormous capacity for love, loyalty and affection. Inherently able-minded and intelligent, the Shepherd can be trained to a very good degree and is known for being incredibly devoted to children. Click here for more information on the breed. Lower in the list than some might have thought, the Golden retriever is widely considered one of the most popular breeds, not only as a companion dog but in obedience, service and therapy. Believed to have been developed by Lord Tweedmouth in the late 1800s, the Golden retriever has its roots in the Scottish Highlands where it was selectively bred for the purposes of hunting, tracking and retrieving upland game, as its name would suggest. Easily identified by its wavy golden coat, the retriever is medium-sized with a straight muzzle, large brown eyes, feathering on the ears, back of legs, underside of tail and front of neck. Highly trainable, the breed is the ideal choice for the modern family, being devoted to children and demonstrating love, loyalty and affection. Like the Labrador retriever, the breed’s natural love of people is showcased at every opportunity. Click here for more information on the breed. With its rustic, working appearance, the Border terrier is easily identifiable and has been held in high esteem. 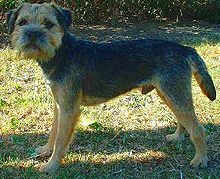 First developed in the early 18th century in the Cheviot Hills, the Border Terrier was primarily bred for the purpose of flushing out and killing foxes that were attacking the farmer's livestock. Highly valued for its willingness and stamina, the Border terrier rose to tremendous popularity in the century, also hunting otters, badgers and vermin. The Border’s wiry double coat is commonly coloured wheaten, blue, tan, grizzle, red and white, which may have aided the breed's camouflage in the outland terrains of the border. The Border Terrier is an affectionate, loyal and mannered breed, displaying a relaxed temperament that makes for an ideal companion. Compatible with children and other house pets as well as being a practical size, it is unsurprising that this breed appears on the popularity list. Click here for more information on the breed. Less of a lap dog, more of a fully-fledged canine side-kick, the Bulldog is just behind its smaller counterpart on the list of popular breeds. Commonly titled the ‘National Dog of Great Britain,’ the breed features in various patriotic pictorials – for this reason alone, the Bulldog simply had to appear on the list! Once the so-called sport of bull and badger baiting was finally outlawed in 1850, the Bulldog grew in popularity as a fearless yet increasingly placid companion dog, hence its positioning on the list. Bearing in mind its early sporting heritage, the appearance of the Bulldog is somewhat intimidating; however such is not a fair reflection of its nature. The breed possesses an easy and affectionate temperament, is protective of children and its home, and is a great lover of people. 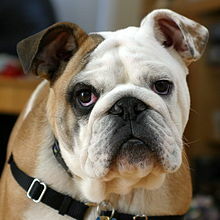 The appearance of the Bulldog is distinctive and clearly desirable. Anyone wanting a dog with an outwardly fierce appearance but a mellow interior should seriously consider buying a Bulldog. Click here for more information on the breed. A new entry on last year’s top 10, the Miniature Schnauzer is thought to date back to the 1400s. The breed’s early usage was as a guard dog, standing watch over traveller wagons as merchants moved between villages. Part of the 'working' breed group, the Schnauzer was primarily bred in Germany for the purposes of cattle droving and livestock guarding. During WWI the breed was widely used as a messenger dog, carrying its message doggedly through shellfire to reach its recipient. Retaining its natural guarding instincts and protective temperament, the Schnauzer requires firm leadership, consistent training and early socialisation to adapt well to domestic life. But when trained, the Schnauzer is both obedient and affectionate, adapting well to new situations and people. A great addition to an active family home or a dedicated sole owner, as long as its needs for exercise and companionship are met. Click here for more information on the breed. If you have a dog and would like to post a comment on what it is like owning a particular breed, please share your knowledge/experience with us! Alternatively, you can post your comment directly on the breed page in VioVet’s Breed Facts and Information. I love my hairless Chinese Crested!!! Doesn't anyone love Airedales any more? don't care if he is not the most popular, I wouldn't swap my Border Collie for all the proverbial tea in China !!! Really pleased that neither of mine is any where near this list and long may that continue! We would rather be special and unusual than popular any day. I have 3 dogs all different breeds and they are all top dogs to me. Irish Setter the best cuddle, a Terrier X a real character and a Border Collie Rescue, she now knows what love is in her forever home nobody can or will ever hurt her again.